Welcome to our review of the Alpen 20–60×80 Spotting Scope. I’m new to Alpen optics, but I’ve ready plenty of good reviews of their products. Many owners of Alpen spotting scopes say they rival the more expensive Swarovski. Let’s take a look at this spotting scope and decide for ourselves. The case is fantastic, but the tripod is a real star here. The tripod is small, but is very well constructed with the ability to pan both vertically and horizontally. Please note that this is based on a cast aluminum included tripod. Some reports hint that Alpen has started shipping the spotting scope with a less effective plastic tripod, so you may want to ask the seller about the quality of the tripod before you make the purchase. With its 80mm objective lens, the Alpen 20–60×80 Spotting Scope is able to achieve zoom magnifications from 20X to 60X. The resolution is fantastic at 20X, with clear, sharp images that look close enough to touch. At maximum magnification in high heat, the images lose some sharpness. Stationary objects aren’t a problem, but moving targets begin to get fuzzy at 60X. At 50X, though, everything stays nice and sharp in all weather conditions. Perhaps Alpen should have stopped at 50X with this model. Field of view on this model is 55 feet at 1,000 yards with 60X magnification, or as much as 113 feet at 20X zoom. This is quite generous, and provides you with lots of room to find and then zoom in on your subject. The 18–19mm eye relief is a bit close, but still very comfortable to use. Unfortunately, the eye relief is a bit shy of what you really need to see the full field of view. Is the Alpen 20–60×80 Spotting Scope Easy to Use? 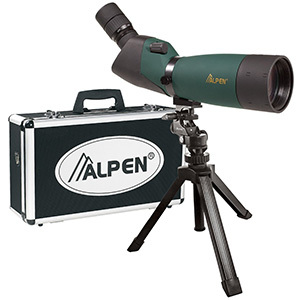 The Alpen 20–60×80 Spotting Scope is lightweight at just 56 ounces, and features a center focus system. You only have a single focus control, unfortunately, without any means to switch from coarse focus adjustment to fine-tuned tweaks. The tripod ring rotates around the barrel, allowing you to rotate the body of the scope without changing your aiming point. This model also provides an adjustable collar on the eye piece, allowing you to reposition it with a simple twist of the barrel for use when sitting or standing. How Well Does the Alpen 20–60×80 Spotting Scope Handle Light Transmission? With its fully multi-coated optics, the Alpen 20–60×80 Spotting Scope is fantastic at light transmission. The 80mm objective lens allows a lot of light in, and I’ve used this spotting scope comfortably during early morning and late evening hours. I’ve even used this spotting scope to examine the surface of the moon at night, without any problems whatsoever. The Alpen 20–60×80 Spotting Scope features BaK–4 fully multicoated optics, providing fantastic brightness, resolution, and edge clarity. The porro prism design is perfectly aligned, giving you perfectly crisp and clear images at all times (except for highest magnification in hot temperatures). 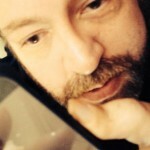 The focus works well, but I would like to see dual fine and coarse focus controls. How Good is the Housing on the Spotting Scope? The housing is solid, but looks like cheap plastic. This is misleading, though, because the spotting scope’s housing is actually quite durable and rugged. I’ve dropped this spotting scope a couple of times, and it caused no damage to the prism alignment or optics, and the housing barely even got scratched up. The controls are easy to reach, and spin smoothly with just enough friction to prevent accidentally bumping them out of focus. How Durable is the Alpen 20–60×80 Spotting Scope? Alpen designs its spotting scopes to be waterproof, dustproof, and shock-resistant, so they perform wonderfully in just about any terrain or weather conditions. The housing looks cheaply made, but it is actually one of the most durable spotting scopes I’ve ever seen. The barrel is nitrogen-filled to prevent fogging, and the optics are O-ring sealed to keep out water. Alpen is so confident in the quality of workmasnship that they cover this spotting scope with their “Alpen Lifetime No Fault Warranty.” If you have any problems with your Alpen spotting scope for any reason, they will repair or replace the spotting scope free of charge. You don’t need a receipt, they ask no questions, and they give you back your spotting scope (or its replacement) in perfect working order. I’ve never seen such a liberal product warranty for a spotting scope. Thanks for reading my review of the Alpen 20–60x80 spotting scope. This spotting scope is less expensive than some competing scopes that aren’t built as well, and it outperforms even Swarovski spotting scopes in almost all conditions. If you plan on using it in high temperatures, you need to know that the maximum resolution can get hazy above 100ยบ F, but other than that, this is one of the best spotting scopes on the market today.